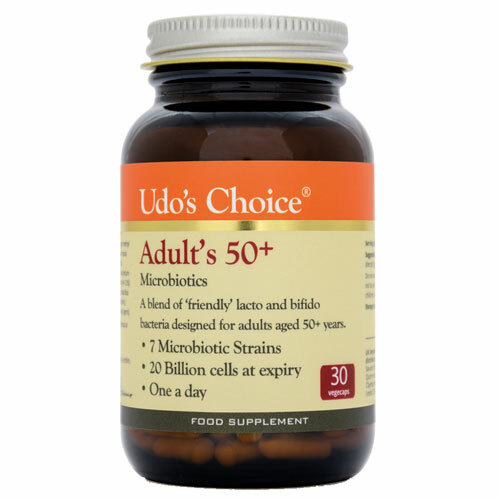 Udo’s Choice Adult’s 50+ Blend Microbiotics contains 7 specific bacterial strains at an appropriate strength for seniors – designed for optimum bowel health. This probiotic helps recreates the healthy digestive environment of years gone by – and regular supplementing helps keep it that way. Seniors generally need a large quantity of beneficial bacteria and several varieties of bifidobacteria (which decreases with advancing years) for optimum bowel health. 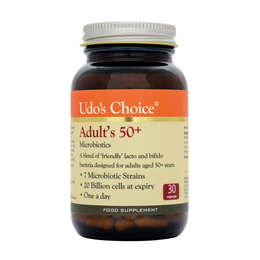 The specific strains used in Udo’s Choice Adult’s 50+ Blend have been specially chosen for their value ability to support lower bowel health by replenishing digestive microflora on a continuous basis and have been formulated to to the appropriate viable count. Each vegetarian capsule contains 34 billion viable cells at time of manufacture and at least 20 billion at expiry in a base of potato starch, ascorbic acid, stearic acid, and silicon dioxide. Support and maintain healthy intestinal flora following a course of antibiotics. Lactobacillus casei (HA-108) : 30%, Lactobacillus rhamnosus (HA-111) : 20%, Lactobacillus acidophilus (HA-122) : 10%, Lactobacillus plantarum (HA-119) : 10%, Bifidobacterium bifidum (HA-132) : 10%, Bifidobacterium breve (HA-129) : 10%, Bifidobacterium longum (HA-135) : 10%, potato starch, ascorbic acid, stearic acid, and silicon dioxide. Capsule: Hypromellose. Consume one capsule per day with food to maintain healthy intestinal flora or three capsules per day. Can be increased to three capsules per day if required. Below are reviews of Udos Choice Adults 50+ Blend Microbiotics - 30 Vegicaps by bodykind customers. If you have tried this product we'd love to hear what you think so please leave a review. Great product but I agree that it would be better in larger amounts. Great probiotics, used after having gall bladder surgery and also suffer with food intolerances and find these really helpful. If ever I run out notice the difference. Yes please to bigger bottles. Why don't you do bottles with 60 or 90? The bottle is't even half full. Happy with these. No Prebiotic which may irritate sensitive tum, so good. Wonder if changing probiotics can be a positive as each have different strains and formulations which add to the diversity in your tum? Helps my slow digestion. I was recommended this product, it has helped my digestive system. My husband had repeated UTIs, Clostridium Difficile and other problems needing many antibiotics. Wishing to strengthen his immune system, I gave him one of these a day and the troubles have not recurred, meaning he has gained strength and is more like his old self. Please try these if you have similar problems! I have had stomach issues for over 20 years. No doctor could find out what was wrong with me. I took these as a suggestion by my sister and just after taking ONE tablet I noticed a huge difference. Don’t want to tempt fate but since taking one of these a day (I find taking before food more beneficial) I have had NO issues with my stomach at all. I cannot recommend these enough. Udo’s Choice Adult’s 50+ Blend Microbiotics contains 7 specific bacterial strains at an appropriate strength for seniors – designed for optimum bowel health.